The first walk I didn't complete. I tried the Cloud 7 in 1998 on a warm 8th August. I wasn’t exactly in my prime, but I was keen to give this walk a try. I had done the "Chatsworth" and the "White Peak". The Cloud 7 at 33 miles, or 28 miles if you did the short route, was only a little bit longer than previous "marches", and I’d been in the first 50% of the finishers in those. So I filled in the form, paid my money and at the appropriate time I was outside the Royal Oak at Rushton Spencer ready for the off with Ray and his friends Bob and Tommy. Bob and Tommy are both older than us but when it comes to "route marches", such as the Cloud 7, they are in a league of their own, particularly Tommy, a wiry little Irishman who moves quite effortlessly. But more about Tommy later. Usually on these challenge walks one sees a variety of rucksacks, usually quite big, between 25 and 35 litres in capacity, and often quite full. Today I saw very few rucksacks. Bum bags were the order of the day and instead of walking boots the majority wore "trainers". Today I was walking with the "professionals". These seemed to be the elite of the Long Distance Walking Association which had organised the walk. But was I put off? No. Was I apprehensive? No. Well maybe just a bit! It was time to go. The starter started us off and we walked at what I thought was a brisk pace up the road. At least I thought it was a brisk pace but I think the "professionals" were just warming up. Now as I stated earlier I’d done the "Chatsworth" and "White Peak" but these guys and gals were something else. With lightweight footwear, minimal "luggage" and the very skimpiest of clothes - Larry would have enjoyed that on the female form - they were soon walking at a very very fast pace. Within a mile or so half the field had vanished. I think some were running though and there was no way I was going to run with boots on and a proper rucksack on my back. By the time we reached the Gun, the first high point of the walk at 1254 feet and situated to the east of the start, Tommy was some distance in front of us. Bob was also not in sight but by the time we reached the bottom of Hen Cloud we had met up with him again. So we enjoyed cold drinks at the bottom of this gritstone buttress before we started to climb it. By now we were getting warm. It was developing into a hot day. We were also slightly deflated as there were only a couple of walkers behind the three of us. But we plodded on, or maybe I should say climbed on as we struggled up Hen Cloud. 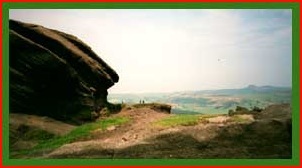 I have done Hen Cloud a couple of times since then - at the beginning of days on the Roaches - but on this first occasion, with 5¼ miles already behind us, it was hard, very hard. From the top of Hen Cloud we could see Tittesworth Reservoir and Leek further in the distance. However, we had no time to enjoy these wonderful views and were soon on our way again losing height before we regained it on ascending the Roaches. 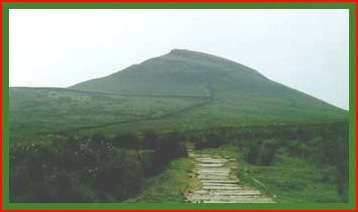 Now for the slog up Shutlingsloe. A very impressive hill. Not that big, but still big enough to dominate the immediate area. This side of Shutlingsloe is very steep and it was a relief to get on the top and then take the gentler slope down to the Macclesfield Forest. From here it was along paths, along lanes and over fields until we reached the third check point on the Cat and Fiddle Pass near the base of Shining Tor. It would have been nice to continue on from here. However, although initially neither Ray or I wanted to admit defeat we were both feeling physically and psychologically weary. We weren’t the last walkers, but we only just missed that title. There were only two walkers behind us. On the pull from the Macclesfield Forest we had both expressed our tiredness and decided to "call it a day" when we reached the Cat and Fiddle Check Point. A distance of 14 miles since we started from Rushton Spencer. Seemed more than that! We gave notice that we were retiring, sat down at the side of the road with other weary walkers and enjoyed the early afternoon sun. We ate the remains of the refreshments at this check point and watched the traffic, including a large number of "boy racers" on their motorbikes taking advantage of this twisting road between Buxton and Macclesfield to demonstrate their skills. I felt quite sad about retiring and I am sure Ray did too. It is the only challenge walk either of us have given up on because of fatigue. But it was quite a relief to just sit there enjoying the views, eating and talking to other "drop outs" as we waited for transport to get us back to Rushton Spencer. Back at the Royal Oak at Rushton Spencer preparations were well in hand for a barbecue. Ray and I sat in the shady bar with a long cool alcoholic drink. By now we had had our fill of orange squash and water and wanted something a little bit more appetising to have with our burgers, which were soon available from the barbecue. Exactly 10 hours after starting Tommy arrived. He did look weary. His shirt was tied around his waist. He was covered in sweat. But he’d done it. After leaving the Cat and Fiddle he, like the other walkers, would have gone over Shining Tor – I really must go up it one day – then on to Teggs Nose, Croker Hill and The Cloud before getting back to the start. 33 miles with ascents totalling 5400 feet. Ray and I were very impressed and soon provided him with a pint to help quench his thirst. Well done Tommy. About an hour later Bob arrived. He to had done the full course and soon was having his thirst attended to. A couple of years later Ray completed the walk. I still haven’t and I don’t know if I will. Age is taking its toll, but I will always remember my attempt to do the Cloud 7 Circuit and whatever their times I congratulate all who have completed it, especially Tommy.